Helmets should have about 1-inch of firm polystyrene foam. It may not be visible, but you should be able to feel the thickness. 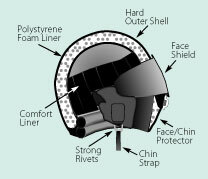 If the helmet only contains soft foam padding or no padding at all, then it is a unsafe helmet. The DOT safety standard includes strong chinstraps and secure rivets. An unsafe helmet will weigh a pound or less. Your safe helmet should be around three pounds. An unsafe helmet will have any protruding attachments/decorations that will extend further than two-tenths of an inch from the helmet's surface (with the exception of visor attachments). A helmet that meets or exceeds the Federal Motor Vehicle Safety Standard 218 will have a DOT sticker on the outside back of the helmet. Beware of novelty helmets sales, which may sell DOT stickers separately. In this case, the DOT sticker is invalid. Private and/or non-profit organizations such as Snell or ANSI will place labels on the inside of the helmet, stating the helmet meets their safety standards. In addition to the DOT stickers, these are good indicators that the helmet meets all required safety standards. Under the FMVSS 218, manufacturers are required to label their helmets with their name, the model, the size and the month/year of manufacture. It must also state the construction materials and space for the owner to list their information. If you need an motorcycle accident attorney, call the Andrew Kim Law Firm. Our office features a personal injury attorney who is experienced in several different types of Washington personal injury claims, and will help with your need of a Bellevue car accident attorney, Tacoma wrongful death attorney or a Seattle boat accident attorney. Call us at (425) 289-1990, (253) 682-2000 or (800) 636-3676.